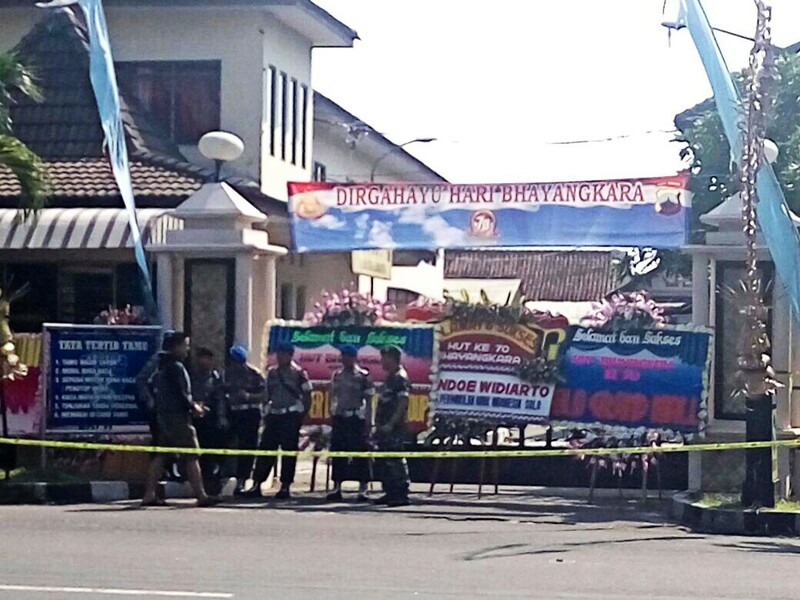 Central Java Police Indonesia Automatic Fingerprint Identification System (Inafis) personnel continue to investigate the scene of a suicide bomb attack at the Surakarta Police headquarters on Tuesday morning. The police are in the process of examining the remnants of a motorbike used in the attack, identified by the number plate AD 6163 HW. The attack was carried out in the front yard of the Surakarta Police headquarters on Jl. Adi Sucipto, Manahan, Surakarta, Central Java, at 7:30 a.m. Before the blast occurred, a man riding a motorbike broke through the entranceway of the police station, explained a policeman who wished to remain anonymous. Brig.Bambang Adi Cahyo, a police officer on guard at the time of the attack, attempted to stop the motorist but the unidentified motorist triggered the explosive device. Bambang sustained injuries during the attack. As of 11:30 a.m., the body of the perpetrator and the remnants of his motorcycle have yet to be removed from the blast site. The blast site has been sealed with police tape but road access to the police station continues to remain open. Hundreds of local residents have begun to crowd the area in front of the station, reportedly hoping to catch a glimpse of the bomb site. “We have reopened road access to Jl.Adi Sucipto so as to avoid causing a disruption to public activities and have reminded the public not to approach the site of the incident,” said Surakarta Police chief Sr.Comr.Ahmad Luthfi. “Let them finish their examination. I have not yet received any data about it,” said Luthfi, emphasizing that the police continued to examine the incident site. He declined to provide further details.